Lately, I've been trying to include two vegetables at dinner each night. My goal is for one green veggie and one other colored veggie. I love this spinach salad because it's so delicious and really easy to make as far as side dishes go. I usually make the bacon first and set it aside and leave the grease in the pan. Then, just as my main dish is finishing up, I warm up the bacon grease and start cooking the onions and mushrooms and proceed from there. From this step, the salad only takes about 5 minutes to get together. I don't usually bother putting in the hard boiled eggs, but they would be delicious. Reserve 3 Tablespoons of the bacon grease. Heat 1 Tablespoon butter in the same pan used for cooking bacon. Saute onion and mushrooms until soft. Set aside. Whisk the reserved bacon grease, vinegar, sugar, mustard, salt and pepper in the skillet over medium low heat. 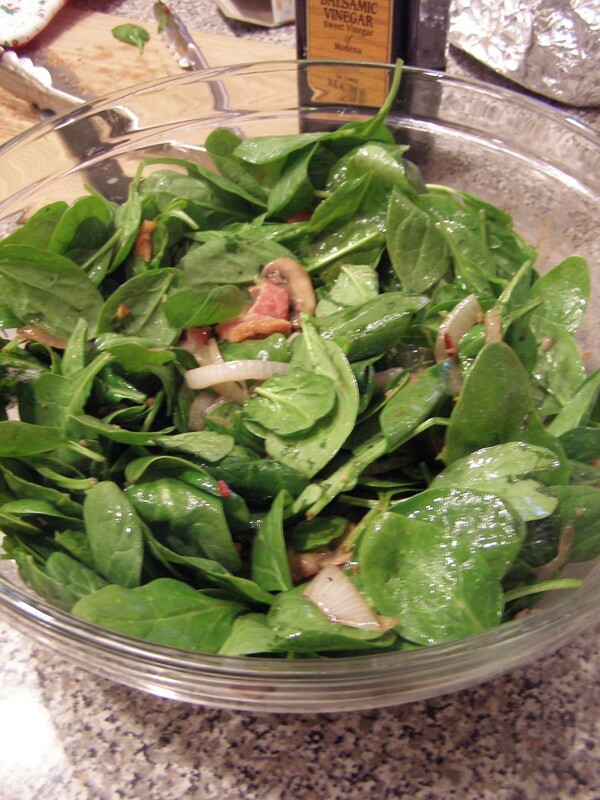 Toss the spinach, onions, mushrooms, and bacon with the dressing. Top with hard boiled eggs, if desired.